The Nossa Senhora Suite merges Afro-Brazilian ritual music and jazz in a new work by Deanna Witkowski for her quartet plus four vocalists. 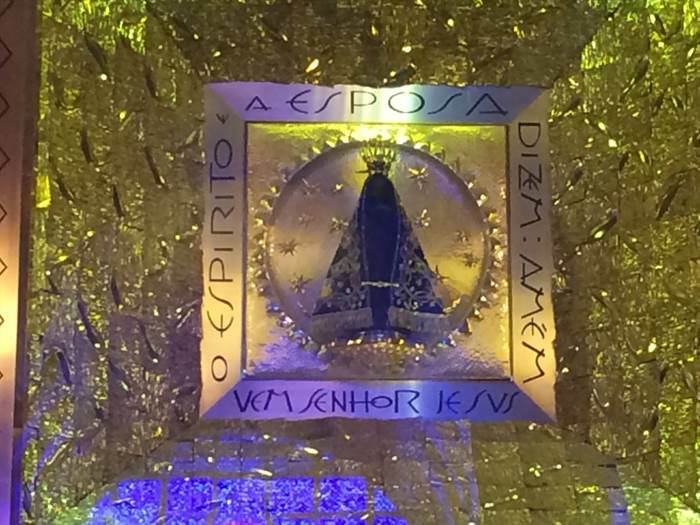 Each movement explores a different Brazilian version of the Virgin Mary, including Nossa Senhora Aparecida, patron saint of Brazil, and Iemanjá, goddess of the seas. Photos are from my spring 2018 residency at the Sacatar Institute in Bahia, Brazil and from my visit to the Santuário Nacional de Nossa Senhora Aparecida (national basilica for Nossa Senhora Aparecida) in Aparecida, São Paulo, Brazil.. Clique aqui por texto em Portugues. A note on donations: When you sign up at any level, you’ll receive exclusive updates during Deanna's travels to Brazil and her composing, rehearsing, and recording process (projected album release date: early 2020). You are welcome to give any amount through the NYFA “Donate Now” button at the top left of this page, or to select one of the perks/levels below. And read on for the story behind this large-scale project! $250: Listing in the CD liner notes. $500: A new song specifically for you! READ my three blog posts on my recent (April-June 2018) nine weeks in Brazil here. I've also been selected as a 2018 New York State Council on the Arts' Individual Artist Grant recipient! Thank you for checking out my new (2018) Brazilian music project, the Nossa Senhora Suite. The seeds of the idea to research, compose, and ultimately record and tour this new suite began in 2006, when I visited Brazil for the first time. I subsequently visited and performed in Brazil in 2007 and 2010- and I also learned Brazilian Portuguese! One of the places I visited on my first trip was the city of Salvador in the state of Bahia. Bahia is perhaps the most African part of the country, and has its own distinct musics and religious practices (candomblé). It is also where I recently lived during an eight week fellowship at the Sacatar Institute in Itaparica, Bahia from April-June 2018 to begin research related to the Nossa Senhora Suite. Read on for more information on the project and how you can contribute. WHERE is the title from? WHAT does "Nossa Senhora" mean? “Nossa Senhora” means “Our Lady” in Portuguese. From the country’s patron saint, "Nossa Senhora Aparecida," to "Nossa Senhora da Boa Viagem" (the saint of fishermen), to "Nossa Senhora do Ó,” there are over 100 different versions of Nossa Senhora in Brazil. And this is just within Catholicism itself. In candomblé, an Afro-Brazilian religion, the pantheon of orishas (gods) is meshed with Catholic saints: Iemanjá, goddess of the seas, is associated with aspects of the Virgin Mary. I’ve recently been reading Maria na cultura brasileira: Aparecida, Iemanjá e Nossa Senhora da Libertação, a theology book by Brazilian theologian Clodovis Boff. Boff explains that Mary- “Nossa Senhora”- is present across many different religious forms in Brazilian culture. The Nossa Senhora Suite (NSS) will merge Afro-Brazilian expressions of the Virgin Mary with jazz composition in a new work. Each movement of the musical suite will explore a different Brazilian manifestation of the Virgin Mary. NSS will combine regional rhythms, melodic lines, or songs associated with Mary with newly composed music for my instrumental jazz quartet: soprano/tenor sax, piano, bass, drums/auxiliary percussion; and four vocalists. The project will premiere at James Chapel at Union Theological Seminary in New York City- a space routinely used for public art and music events- and will subsequently be recorded as my seventh album. NSS furthers my ongoing work in combining jazz and religious liturgy in the context of specific communities. I have presented original liturgical jazz in over 80 churches across the United States, and in late 2017 released my sixth recording, Makes the Heart to Sing: Jazz Hymns, that features 14 jazz arrangements of standard hymn tunes, all meant to be used in the context of singing communities. And while I have released six albums as a bandleader and have been active as a pianist in the New York City Brazilian jazz scene since 1998, this will mark my first project- and recording- to focus solely on my work in Brazilian music. I also love writing for voices (see video below), and have won four choral awards in the last two years for my concert choral writing. NSS brings together my work with music for ritual, my work as a pianist/composer, and my passion for Brazilian culture. Bahia- and the city of Salvador itself- is central to this project. Not only is there a huge number of churches in Salvador- 372 is the unofficial count- but it is also a center of terreiros, spaces where communal candomblé rituals occur. I will spend time in some of these churches and terreiros to learn songs, rhythms, and words that are associated with Nossa Senhora. Since Nossa Senhora is so deeply woven into Brazilian culture, I want to find out what impact this saint has on the daily lives of her followers, especially among Bahian women. After applying for multiple grants and sponsorships over the last several years to begin the Nossa Senhora Suite project, I received my first YES in late 2016 from the New York Foundation for the Arts (NYFA). NYFA is my fiscal sponsor for this project, which means that any monetary donation that you give to NSS is tax-deductible. NYFA does not give me any money: rather, they help steward the money that you give to this project. Right after receiving NYFA’s stamp of approval, I heard back from the Sacatar Institute in Bahia. Sacatar provides unstructured time and space for creative individuals to create new, challenging work in the context of a small community. 20-24 individuals are offered eight-week residencies each year through a competitive Open Call. In my round, there were 388 applicants from 62 countries (and I’m one of the twenty-some applicants who were selected)! Other artists who have spent time at Sacatar include Laurie Anderson, Derek Bermel, and Joan Szymko. My invitation to the Sacatar Institute includes practical help in connecting me with candomblé practitioners and musicians in Salvador. Sacatar will also provide a platform for me to share my work with the local community in Itaparica through their open studio days as well as in workshops in local schools and churches. Perhaps most importantly, Sacatar will give me a base of support by providing a place to live and create among four other artists during the two months. Having traveled to Brazil on my own on three occasions, I know that having this practical support will make doing my research much easier. I also have support at home from Dr. Claúdio Carvalhaes, a Union Theological Seminary professor originally from São Paulo. 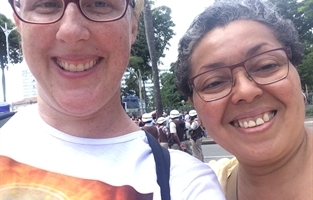 In 2010, I spent two weeks with one of Claúdio’s classes in Rio and Salvador, visiting different houses of worship (including a candomblé terreiro) as well as meeting theologians in both cities. I will be meeting with Claúdio in December to develop a short list of contacts in Salvador who I will be in touch with in advance of my trip. While Sacatar will reimburse my round trip plane fare from New York to Salvador, and will provide room and board during my two months at their institute, I need to raise $34,220 for the entire Nossa Senhora Suite. This includes all of the costs related to the studio recording, musicians’ fees, and costs related to the premiere at Union Theological Seminary’s James Chapel, including publicity and videography. 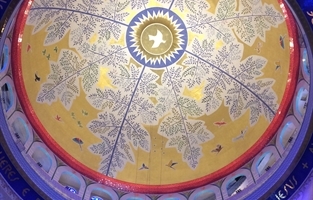 It also includes funds to conduct further research on a side trip after Sacatar to visit the national shrine of Nossa Senhora Aparecida in São Paulo, a place of pilgrimage for devotees of Nossa Senhora. You can contribute any amount here at my NYFA page. For contributions of $25 or more, you can receive specific perks, including recordings (both the upcoming NSS recording as well as my earlier six albums), a mention in the album liner notes, or a new song written specifically for you. Please note that if you choose a perk, your tax-deductible portion will be the full amount minus the value of goods received. When you sign up at any level, you’ll receive exclusive updates during Deanna’s time in Bahia, as well as during her composing, rehearsing, and recording process (right up until the album release)! Please note that you are welcome to give any amount through the NYFA “Donate Now” button at the top left of this page. For any of the specific perks listed below, please choose the appropriate button. Nossa Senhora Suíte vai mesclar as canções de rituais afro-brasileiros e jazz em uma nova composição para meu quarteto de jazz, percussão e quatro vocalistas. Cada movimento pretende explorar uma faceta diferente da Virgem Maria, incluindo Nossa Senhora Aparecida e Iemanjá. A princípio estarei na Bahia para uma residência artística no Instituto Sacatar de 9 de Abril a 4 de Junho de 2018. Leia sobre os Artistas Residentes do Sacatar aqui. Durante minha temporada no Brasil, vou visitar a Irmandade da Boa Morte, na cidade de Cachoeira, pra aprender canções e palavras especificas que descrevem Nossa Senhora. Também quero conversar com mulheres pra saber de que maneira a fé em Nossa Senhora é uma força em suas vidas. A idéia é colocar qualidades das diferentes Nossas Senhoras junto com as qualidades da Iemanjá na composição deste novo trabalho. Me mande um email aqui se quiser mais informações.